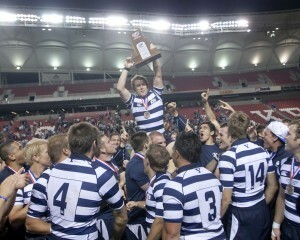 Thousands of BYU fans gathered at the Rio Tinto stadium on Saturday night to witness the BYU Rugby team take the national championship title against Arkansas State. The final score was 49-42. The Red Wolves took advantage of the Cougars’ slow start. Arkansas scored a penalty goal in the 2nd minute, which was shortly followed by its first try in the 5th minute. The scoreboard marked 0-8 for the Red Wolves.